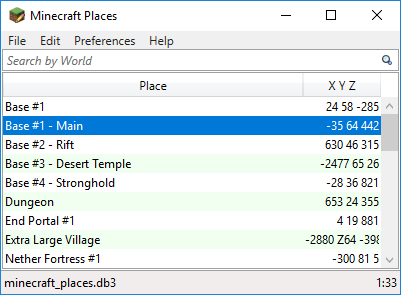 Stores coordinates of important places you find in your Minecraft worlds. Keep notes about each place. You may also edit/copy a place and change what is needed. You may also delete places you no longer need. By downloading the software listed on this page you accept that Carroll Dearstone (hamradio) is not responsible for your (the end user) use or misuse of the software.